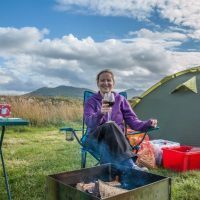 However, camping is LT’s favourite past time, so I made a list of camping essentials I absolutely must have in order to go along with the whole idea. Must be somewhere fairly safe to cut down on the prospects of being murdered in the night by some crazy who’s out combing the countryside for suitable victims. It happens; I saw it on CSI. I can’t stress this enough. Sleeping on the ground, no matter where that ground may be is just not fun. Sleeping on the ground on a proper blow-up mattress is much more, well…what you’re used to, no? No one wants to be put off the idea of sleeping on their shiny new inflatable camping bed by the prospect of blowing it up, am I right? Splash out, get yourself an automatic pump and sit back and watch as it works its magic. While you watch, probably get yourself a glass of wine. There are masses to choose from, but I like to have one with arms and a nice wine glass/bottle holder built in. I also like the one that’s easy to dismantle and pack away the following morning. These are usually pretty cheap, easy to store and waterproof. I use them at home all the time anyway, but these are an essential part of my pack – particularly if we’re wild camping and I have no access to showers and toilet blocks. Not only are they great for cleaning humans, but also brilliant for cleaning equipment. I hate feeling manky after camping, so these allow me to show my face in public the following day if we stop off for a coffee on the way home. Les simply points it in the general direction of some cotton wool balls, strikes it and watches it go up. This is very handy when you’re starving and can’t eat because you’ve got no fire to cook your sausages. OK, so they’re not essential essential, but they do make me a much happier camper. I’ve been seriously impressed with the ranges on offer at my local supermarket, as well in many high street stores. I can often be found using my camping glasses at home. This is mainly because I’m not to be trusted with ‘real’ glasses. Note: always go for one that fits into the cup holder in your camping chair… also; get one that won’t be blown over in the wind. There’s nothing more likely to harden my anti-camping stance than losing a glass of wine to lousy weather. OK, so I’d probably miss this stuff if I’d stayed at home. Do you have any camping essentials that you can’t live without?